At some point I’ll write reviews on the hammock, underquilt, tarp and all the other paraphernalia involved in setting up a hammock. Right now I’m too much of a rookie myself to make objective comments or comparisons. But, I can share some of the things I’ve learned so far. If you’re an experienced hammock camper, I’d welcome any tips and suggestions you’d like to share in the comments. First off, at this point in my hammock camping career, I will call B.S. on the claims you can set up a hammock more quickly than a tent. I know for a fact I can set our three-person Mutha-Hubba up in ten minutes, and break it down in the same time too. The hammock, thus far, I don’t think I’ve got it set up in less than 45 minutes. There are lots of bits of string to unravel (and wind back up again) in my set up. We’ll see how much quicker I can get with time and practice. Picking a spot for a hammock seems to take just as long as it does with a tent (I’m talking about wild camping here), but is probably a bit quicker as you don’t have to seek out a level spot, so the sides of hills are up for grabs, which is a great bonus. On the other hand, you do need to find two trees a sensible distance apart, and (the most difficult bit) with nothing tall growing between them in a swath about as wide as your tarp. Whether you’re ‘ground dwelling’ or ‘hanging’, you need to check for widow makers (trees and/or suspended/dead limbs that’ll fall on you, unannounced, in the middle of the night). In my experience, widow makers seem to be deliberately placed in every promising place to set up a hammock (or a tent). Getting in and out very quickly becomes second nature. Getting up to pee in the middle of the night is not the problem I thought it might be (you wait one day you’ll be ‘older’ like me and unable to sleep through the night without having to get up). I’ve discovered that when I sit in the hammock sideways it helps to fold over the edge of the hammock, and/or put something over the edge to pad the back of my legs. I use my camp fleece, or my Shemagh. If you don’t do this the edge of the hammock can dig into the back of your legs — that’s not good for people like me with poor circulation. Ooh look, socks and huaraches! I didn’t want my core temperature to drop while I was sitting around so I put my special wool socks on. I tried wearing them overnight, but I had to take them off — I was too hot. This is obvious but worth mentioning. In bad weather, you can set up the tarp first and then work under it, though it’s worth noting that in really bad weather you’ll want to make sure the tarp is only just clear of the top of the hammock to minimize the bad weather/wind coming in under it. I normally set the tarp a lot higher so that I have standing room, but that’s just a personal preference. This is another personal preference. I really like setting the tarp on a ridgeline. It makes it very quick and easy to adjust the positioning of the tarp over the hammock. Adjusting the tension is easy too. Coiling small lines. I’ve been sailing on and off for longer than I’m willing to admit, and I didn’t think I had anything to learn about coiling ropes. Ha! I was wrong. Check out some rock climbing videos. For thin lines coil them in a figure of eight. It prevents all the kinks and twists and the coiled line unravels without trouble. I do this with my bear bag line now too. I can drop the line on the ground and it’s ready to use, no need to flake it out to remove any potential kinks or knots. It’s a miracle! I’m going to have to check this out on paracord, which I stopped using because it would always end up in a knotted mess no matter how carefully I coiled it. Another obvious one, the further apart the trees, the higher up you have to set the straps. This is okay until the trees are far enough apart that you can’t reach high enough. I’m short, so a 24′ span is about my limit unless I can find something to stand on. In theory, I could set up my hammock on trees 30′ or so apart, but I’m willing to bet I’d need to stand on someone’s shoulders to set the straps (or set them up as tight as a bow — which is not a good idea or recommended practice). Dutchware Chameleon Hammock set up at around 24′ between trees. I had fun getting the suspension high enough for the span. 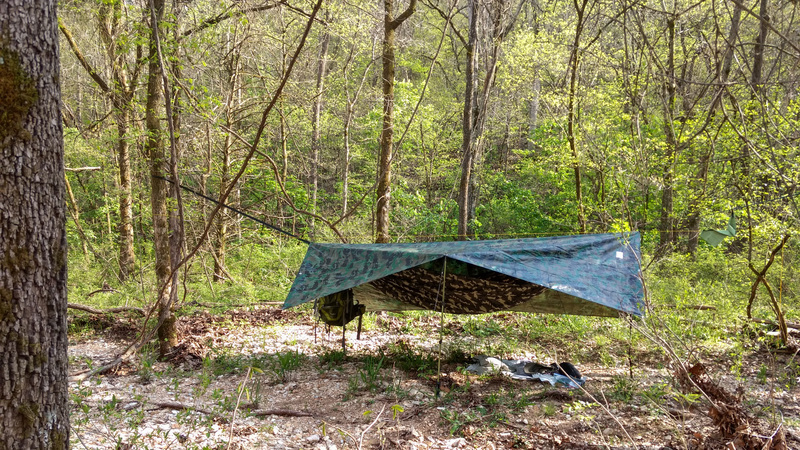 If your trees are a long way apart, don’t be surprised if you need to setup your tarp ridgeline below the hammock straps, which is something to keep in mind if you are setting up the tarp first in bad weather. A big groundsheet is a huge asset. I’m now using a 6’x3′ Tyvek sheet, which is a great improvement over my former one — which I think was 4’x2′– I use my groundsheet to empty my pack out onto when setting up. This bigger (6′ x 3′) groundsheet works a lot better for me. The diagonal lay works. If you’ve not heard of it, you lie at an angle across the hammock, which really does give you a much flatter profile in the hammock. Assuming I continue hammock camping any future hammock I get will be able to accommodate this. You can use a sleeping pad in a hammock, but as I’ve found out it gives a very different experience, as the pad stops the hammock wrapping around you. I was really surprised with my first night out without a pad. Of course, if you don’t have a pad, you will need an underquilt. One problem I’ve found with a hammock is finding places to keep my loose gear. I need some ‘gear caddies’ to hang over the hammock’s ridgeline. There are D-rings on the outside of my hammock that can be used to attach pockets or gear to as well. But it’s not as easy as just dumping things on the floor or in the vestibule of your tent. I may get used to just leaving stuff on the groundsheet under my hammock, but at the moment it’s not something I’m keen on doing. Hanging my backpack on an ‘S’ hook at the foot of the hammock seems to work well, but the pack is going to need some protection from the weather if it gets bad. Currently, my plan is to move it onto the ground sheet under the hammock during bad weather or maybe drape my rain poncho over it. I’m finding that I have to be a lot better organized, because I keep a lot of what was loose stuff in my pack rather than in the huge side pockets of the tent, or thrown on the foot of my pad. Being better organized isn’t necessarily a bad thing though. However, the latter probably contributes to my extended set-up times. Once the hammock is up it’s very difficult to not sit in it. After all, you have to check that you have the height correct. Right? And there’s no harm in laying back and taking a quick break either. Weight-wise my current set up is not a lot less than my one-person tent, which is around 3lbs 8oz. But, with the hammock, I don’t need a pad (or the inflator) which weighs in at 1lb 12.6oz. Though you do need the underquilt which in my case for shoulder seasons weighs in at 1lb 4oz. So in total there’s almost 1lb difference. It’s not a huge amount, but there are no tent poles and it seems to pack down a lot smaller. That and the comfort factor are huge reasons to camp with a hammock. After a lot of online research, this is the gear I’m currently using. DutchWare Chameleon Hammock (plus bugnet) I first came across DutchWare when I was looking for a replacement suspension system for our original ‘lounging’ hammock. When I started looking for a camping hammock the DutchWare Chameleon was highly recommended and received rave reviews. I checked out dozens of different hammocks and this was the one I settled on. DutchWare Chameleon Hammock, double ended stuffsack and suspension with Beetle Buckles. Dutchware Straps, beetle Buckles, and Clips What can I say — I have two 15′ suspension straps. Hammock Gear ‘The Quest’ 12′ Tarp, The Chameleon is around 11′ and the advice online was that an 11′ tarp should be long enough. I wanted to make sure that my gear stayed dry in the heavy rainstorms we get in the Ozarks, so I went with a 12′ tarp. I also like propping up the center of the tarp with my hiking pole — it gives a better view out from the hammock, so I asked if I could have two extra tie-downs fitted to my tarp. Hammock Gear were a complete pleasure to deal with, they got straight back to me with a very reasonable price for fitting the two extra tie-downs — $20, so that’s what I did. As an added bonus, when those strong straight-line Ozarks winds hit I’ve got extra tie-downs to hold the tarp down. Hammock Gear Incubator Econ 40 This was a no-brainer. For the amount you can spend on a pad, this underquilt seemed like a good deal to me. You can make your own, but I’m busy with other things, so buying one wasn’t an issue. If I decide to go 4 season hammock camping I’ll be buying the 20° Incubator underquilt and the Chameleon Winter Cover. I’d better start saving up! DutchWare Gear Chameleon hammock. When I first saw this picture I thought I’d set the hammock up wrong. Then I realized it’s just the weight of the backpack pulling the near end down. Morning view from my hammock. Once again enjoying the view and my coffee. Notice the long pants. So far I’m really enjoying hammock camping. I love the comfortable nights’ sleep I get, and I like being able to just sit and swing while watching the world go by. However, I’m not quite convinced that my tent camping days are over yet, especially in the winter, but we’ll see. If you’re an experienced hammock camper, it’d be great if you could please share your tips and suggestions in the comments below.